Sheffield Limo Service Specialise in LGBT wedding Limousine Hire and Hummer Hire for Pride days and Nights. Be proud to be LBGT in Sheffield. Come on now guys and girls, you’re all looking for that something different and exciting that no-one has had before you? And that’s just what the Sheffield Limousine Service can provide for you and up to fifteen guests on a Proud Day & Night to remember! What service should you expect from Sheffield Limos? 1. Proud Day to remember. Not a miss-spelling. At Sheffield Limos, we have a really good local knowledge of the area, and also have knowledge of the current trends. Some of the current favourites are a recording studio session at the Big Dog Studios, where you can record a special tune with your friends and the Bronx Sauna on Savile Street East during the day. 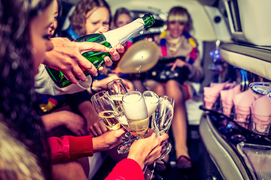 Travelling in luxury with a glass of Bubbly on the way in the Limo having dramatic arrivals and departures is a must to make theses occasions super different! ​2. Proud Night. When you hire us again for the night (discount can be arranged for double trips of course) after giving us any special instructions that you may have, you can leave the night in our very capable hands. Whether its Dempsey’s on Hereford Street, Climax on the third Friday of the month or an extra special night at Q12 at the beginning of the month after you’ve been paid. We have local connections to make sure that you’re not just given a five-star champagne experience inside the limousine but also on any scheduled locations throughout the night where you’ll also be looked after like A List celebrities from your flash arrival until your sad farewell. 3. No Queuing with us. Our chauffeurs take care of any priority passes you may require, so you won’t get cold while queuing. All of these venues can be pre-booked so you and your guests can step out of your chariot, strut your stuff past the queue and into the venue. This will also ensure that you all stick together, partying the night away. 4. Alternative Proud Night. As an alternative if you can handle it, you could try one of the famous Ghost hunting nights at the Fire and Police Museum, where with your arrival in a Large Limo, will let the spirits know who to pay particular attention too. After a couple of cocktails from the bar for a bit of Dutch courage, you’ll be ready to take them all on before retreating to your Limo refuge for a stiff one to recover! 5. Flexibility in options. The Limo can be yours for the whole night, so if you would prefer to Cruise the night away in the City to your ultimate party tunes, or use the Limousine to transport you between various venues then whatever your wish results in our command. 5. Hummer H2 White Taboo. If you have a bigger party size or are picking up friends on the way, then we have the answer in a fully licenced Hummer that holds up to 16 passengers, which allows you to party away in your very own mobile nightclub. You control the style of the music on our very latest sound systems, along with your choice of music videos that are also screened throughout if you wish. Throw open the windows and let your newly recorded chart-topping group song float out into the City air. Sheffield Limo Service will make all of this and more happen for you and your friends to have a Proud Day and Night like no other. You’ll be turning heads as you go, and you’ll be the envy as you’ll have had the ultimate party to remember! To make this happen simply put your details in the form on the right-hand side for a ‘No Hassle Guaranteed’ FREE quote (We Promise). 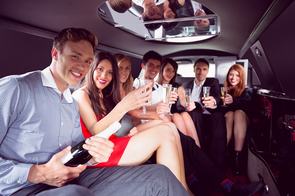 Sheffield Limo Service prides itself in offering the best parties at affordable prices. Or call today on 0151 303 1540 and ask for any special offers that we might be running.